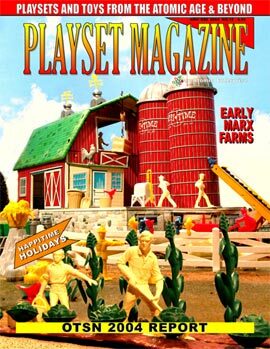 Playset Magazine's farm draught ends with Issue 18, our "Home For The Holidays" issue. 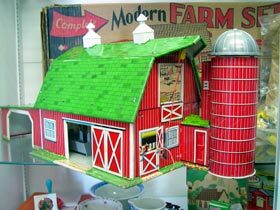 You'll go home to the farm for a hard-core harvest of information on what was in these sets and how they developed through the decade of the Fifties, from little "family" farms with quaint two tone, hard plastic accessories into the behemoth Platform sets with professional farm "workers", new implements and vast array of accessories. What's WRONG with this beautiful farm? 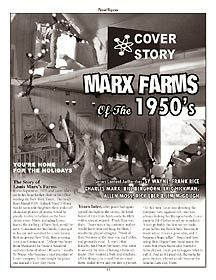 You'll see and know more after PM18 THE FARMS OF THE FIFTIES! Plus lots of ads this time! so you can get your "Wish Lists" filled out -- it's a real Down Home Christmas and we hope you'll join us.